Nvidia's upcoming GPU will bring Turing architecture features to the budget market. Nvidia has revealed just about every possible implementation of it's Turing architecture now, from the extreme GeForce RTX 2080 Ti through the more reasonable RTX 2060, and more recently with the GTX 1660 Ti and GTX 1660 where the RT and Tensor cores (for ray tracing and deep learning, respectively) got axed in favor of lower prices. But there's still one untapped market remaining: the budget sector, and the upcoming GTX 1650 will fill that niche. Here's everything we know about the price, specs, and release date of the GeForce GTX 1650. 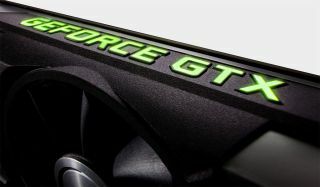 Nvidia hasn't officially unveiled the GTX 1650, so specs aren't fully nailed down. However, all indications are that it will feature either a trimmed down TU116 GPU, the same chip used in the GTX 1660/1660 Ti, or it will use a new TU117 (possibly TU107) architecture. Either way, it will end up with the same level of performance, and it's entirely possible that Nvidia will offer both cut-down TU116 and fully enabled TU107/TU117 models (eg, similar to the multiple varieties of GTX 1060 cards). The key differences relative to the 1660 line will be in the memory configuration and number of SMs (Streaming Multiprocessors), which in turn will determine the number of CUDA cores, texture units, and ROPs. Whether the GPU is a trimmed down TU116, a TU107, or a TU117 (TU116 was likely given as a name because of the pre-existing TU106 that has RT and Tensor cores), it will use TSMC's 12nm lithography, the same as all other Turing GPUs. The GTX 1650 will have 4GB of GDDR5, clocked at 8GT/s—the same speed as the GTX 1660 as well as the previous generation GTX 1060 and 1050 cards. With four active memory controllers it will have a 128-bit bus and 112GB/s of bandwidth, identical to the GTX 1050 Ti. It will also have 32 ROPs (Render Outputs). For the GPU core, rumors and leaked data point to a design with 14 SMs, which means 896 CUDA cores and 56 texture units. As with all other Turing GPUs, the GTX 1650 can do concurrent FP32 and INT calculations, which can speed up gaming workloads anywhere from 15-35 percent (depending on the game), relative to the previous Pascal architecture. GPU clockspeed is harder to pinpoint, because it can easily be tweaked at the last minute. I've seen rumors of everything from a 1560MHz boost clock up to a 1650MHz boost clock. I suspect the reference model will be toward the lower end of that range, to allow for GTX 1650 cards that don't require a 6-pin PCIe power connector, but factory overclocked cards will likely push into the 1700-1800MHz range. How fast will the GTX 1650 be? Since we don't know exact hardware specs and clocks just yet, this is a bit nebulous as well. However, we do know that the GTX 1660 (non-Ti) is only about 15 percent faster than the GTX 1060 6GB. Let me put that a different way: based on core counts and clockspeeds (ie, not accounting for architectural differences), on paper the GTX 1660 is theoretically 15 percent faster than the 1060 6GB. Basically, all the architectural stuff doesn't appear to make a huge difference. That means we can estimate performance of the GTX 1650 pretty well, based on core counts and clock speeds—it will perform mostly like a Pascal card with more cores or clockspeed. How much will the GTX 1650 cost? This is again up in the air, but there are numerous rumors floating around with a $179 price point for the GTX 1650. Simply put, that's too high unless performance ends up being substantially better than the above estimate. It does however reflect a changing market. For more GPU info, check out our guide to the best graphics cards. The GTX 1050 and GTX 1050 Ti were originally launched at $109 and $139, respectively. Current prices meanwhile start at $130 and $170. It could be due to higher GDDR5 prices, or limited supply as Nvidia prepares to replace both cards with the GTX 1650, but either way it's disappointing. Especially in light of AMD's RX 570 4GB pricing, which also starts at $130. The RX 570 4GB trades blows with the GTX 1060 3GB, coming out slightly ahead overall. Compared to the GTX 1050 Ti, however, it's not even close: the RX 570 demolishes Nvidia's card and leads by 45-50 percent on average. Sure, the RX 570 uses more power than the 1050 Ti, about 150W compared to 85W (depending on the model). But no one is going to give up that much performance just to save a few dollars a year in power bills. If the rumored $179 price ends up being accurate, GTX 1650 is going to be really hard to justify. That or its performance will have to be far better than current estimates. Based on the specs and expected performance, I want the price to be back at the GTX 1050 Ti's original $139. Because while AMD may not have anything that can compete with the GeForce RTX 2080 and above, its RX 570 smokes the 1050 Ti, 1060, and 1660 when it comes to value. Who is GTX 1650 for? Taking the above into consideration, you might be wondering who exactly might want to buy the GTX 1650. The way I see it, there are two primary groups that will find the card interesting. First are the people with a PC that can't support a faster or larger graphics card. The RX 570 will almost certainly be faster than the GTX 1650, and it will cost less. However, it's a 150W card and typically requires an 8-pin PEG connector. If you own a PC that lacks such a connector, and you don't want to upgrade other components, the GTX 1650 might be for you. I'd still argue that a basic 450W Bronze PSU and a faster GPU is a better option, however, assuming your PC can accommodate such upgrades. That brings up the second group: people looking for a compact and low power graphics card. The fastest low profile GPU right now is the GTX 1050 Ti. That's thanks largely to its 75W TDP. If you have a case that only supports low profile cards, your upgrade options are extremely limited. Short of upgrading to a completely new PC, which is a far more expensive endeavor, I expect we'll see low profile GTX 1650 cards that don't require any additional power beyond what the PCIe x16 slot provides (75W). When is the GTX 1650 release date? Earlier rumors said end of March, but clearly that didn't happen. Current indications are a late April launch. Since Nvidia often launches new graphics cards between Tuesday and Thursday (all the Turing GPUs so far have come out in the middle of the week), so April 23-25 looks like a reasonable guess, possibly April 16-18. Nvidia could obviously delay the launch (again, or so the rumors go), but there doesn't seem to be much point in doing so. With the current market, the GTX 1650 already faces stiff competition, from both existing AMD and Nvidia GPUs. Time isn't going to make an overpriced budget GPU more attractive.